Fujifilm Frontier-S DX100 Inkjet Photo Printer - With Ink Bundle Consists Of Fuji DX VIVIDIA Ink Cartridge 200 ML Black / Cyan / Magenta / Yellow / Skyblue / Pink by Fujifilm at Pacs BG. MPN: 600013358 B. Hurry! Limited time offer. Offer valid only while supplies last. The Fuji Frontier-S DX100 is a small high quality Frontier inkjet printer that incorporates 6 colored inks producing up to 360 4R prints per hour. 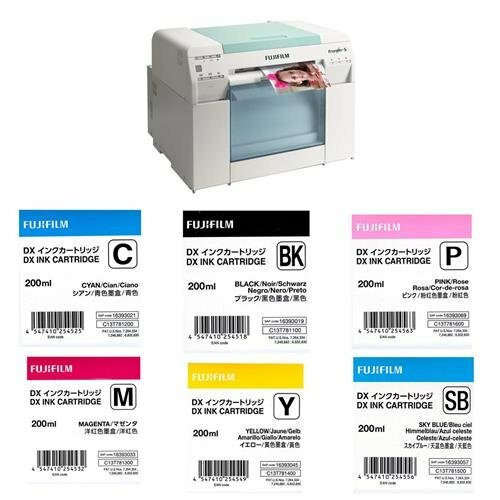 The Fuji Frontier-S DX100 is a small high quality Frontier inkjet printer that incorporates 6 colored inks producing up to 360 4R prints per hour. Compact and fast, the Frontier-S DX100 can produce prints from 3.5" x 5" up to 8 x 39" high quality images and allows for a wider color gamut, finer grain, smoother gradation in backgrounds and improved skin tones. The Frontier-S DX100 meets the diverse needs and challenges of the retail minilab, retail kiosk and Event photography.